July 8, 2012 - The place seems unassuming and you're also likely to miss it. But please don't miss this place. The wait staff is incredibly friendly and the food is incredibly delicious. I am going to make this a regular stop. May 3, 2012 - I was visiting BJU with my girlfriend and decided to try this place. She had never had Indian before and I love Indian so I figured it would be a good experience for her and I was not disappointed by IPR. We walked in and were greeted right away and taken to our table. We ordered some veggie samosas which came out quickly and were delicious she really enjoyed them. We ordered off the lunch menu since we weren't terribly hungry and she got the chicken korma and I got the lamb korma along with some onion naan and plain naan bread. Food came out a little fast but better than taking too long right!? Lamb was cooked and seasoned beautifully and seemed to simply fall apart in your mouth. The rice was tender but not mushy and the naan bread was out of this world! They gave you a ton of food with the lunch option and at a fair price. The dinning room was quiet and we enjoyed a lovely conversation over lunch. The servers were great at keeping our water refilled, clearing plates, and making sure we were taken care of! After lunch we did gulab jamun for dessert and it was so tasty and hot just the way I like it, we also ordered a mango lassi which was again delicious like everything else. 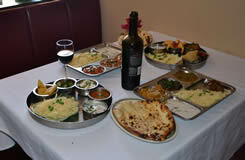 My over all consensus was if you like Indian food, a quiet atmosphere, and fair prices IPR is the place for you. If I am ever in Greenville again I will definitely dine here. On a side not I have eaten at dozens of Indian restaurants in PA/NJ and this was at the top of the list at only a fraction of the cost! April 25, 2012 - Great place for lunch. It doesn't have a lunch buffet but prices are reasonable.